Private space pioneer Elon Musk is laying the foundation for a spaceflight revolution, and he says he could use some support from his hero Neil Armstrong — the first man on the moon — to make it happen. 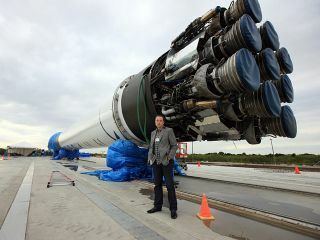 In an interview that aired on CBS' "60 Minutes" Sunday night (March 18), Musk, the founder and CEO of the California-based private spaceflight company SpaceX, opened up about his personal goal of helping humanity become a multi-planet species. And he said public criticism of commercial spaceflight by Armstrong and fellow former NASA astronaut Gene Cernan — the first and last people ever to walk on the moon, respectively — isn't advancing that cause. "What I'm trying to do is to make a significant difference in spaceflight, and help make spaceflight accessible to almost anyone," Musk told interviewer Scott Pelley. "And I would hope for as much support in that direction as we can receive." Musk, a billionaire entrepreneur who co-founded PayPal and is also the CEO of Tesla Motors, established SpaceX in 2002 with lofty goals. He wanted the company to significantly lower the cost of spaceflight, helping our species eventually colonize other planets. He had nothing less than the salvation of humanity in mind. With the retirement of NASA's space shuttle fleet last year, the progress made by SpaceX and other private firms has taken on added importance. The United States now has no homegrown way to get its astronauts to and from the International Space Station, and is paying about $63 million per seat for rides on Russian Soyuz vehicles. NASA is looking to American commercial companies to take over this taxi role, with crew-carrying operations beginning by 2017 at the earliest. SpaceX is one of the leading contenders with its Dragon capsule and Falcon 9 rocket. SpaceX already holds a $1.6 billion NASA contract to use Dragon to carry cargo up to the orbiting lab. On April 30, the company plans to launch Dragon on a demonstration flight, during which it would berth with the space station — a first for any private vehicle. If that test is successful, commercial cargo operations could start later this year sometime, company officials have said. In December 2010, SpaceX became the first private company to launch a spaceship to orbit and retrieve it successfully. Dragon made two complete loops around Earth, and SpaceX personnel fished the capsule out of the Pacific Ocean. Both Armstrong and Cernan have been publicly critical of the plan to shift the crew-carrying burden to private spaceships. Increasing reliance on commercial vehicles could threaten U.S. dominance in spaceflight and exploration, the former Apollo astronauts have said. Musk told Pelley he was sad to hear the criticism, since he admires Armstrong and Cernan so much. "Those guys are heroes of mine, so it's really tough," Musk said. "You know, I wish they would come and visit, and see the hard work that we're doing here. And I think that would change their mind." Musk voiced confidence that SpaceX would win a NASA crew-carrying contract, predicting that Dragon would be the next American spaceship to transport astronauts to orbit. And he suggested that the emergence of private spaceflight will open many doors for the nation, and for humanity. "I think we're at the dawn of a new era," Musk told Pelley. "I think it's going to be very exciting."